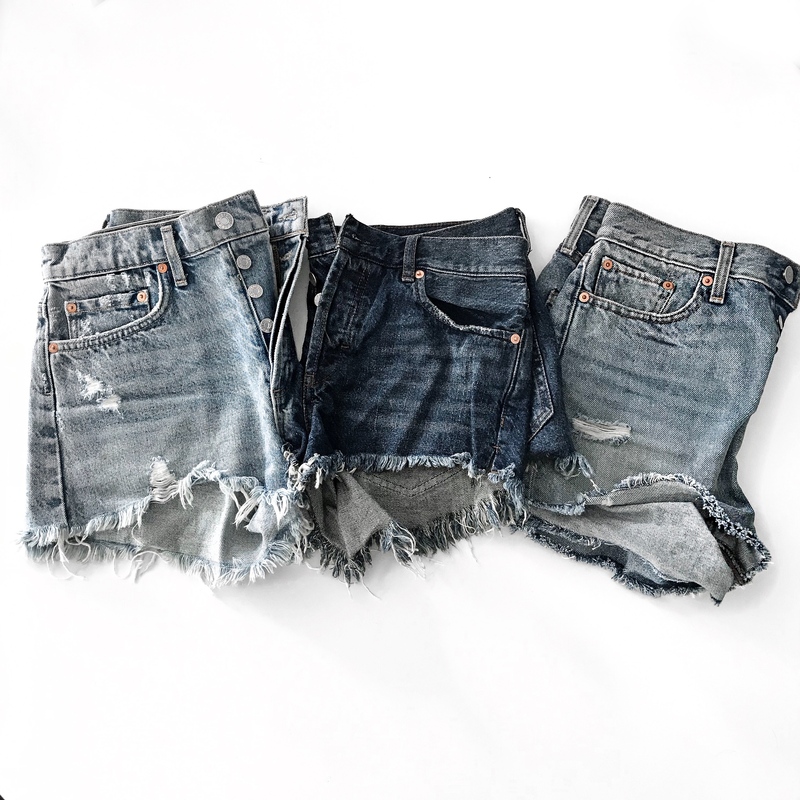 Since we are sliding into March this week I figured I would do a review on 3 of my most worn denim shorts and give you all a look into what I am browsing for spring! So many people are heading to warm weather destination for a vaycay so this may come in handy! These three pairs are my favorites from last year and they are all still available. My number one pair, hands down, were these AGLODE Parker shorts. [on the left] They are worth every single penny. The perfect wash and rise and I love how they are cut more a-line shaped. The bottom of the leg opening does not cling to your thigh. They do run large. I am a 25/26 in denim and I have these in a 26 and they are way too big. I am thinking about ordering a second pair in a smaller size this year. That’s how much I LOVED them last year. I wore them tons. You can see them styled here, here and here. UPDATE: These are a part of the Shopbop sale that is going on now! You can find mine here and they also come in white, black, a lighter and darker wash! I ordered this Free People pair in the spring and it was nice to have a darker wash pair. [in the middle] These are much shorter than the AGLODE pair (and do come up higher on the sides of the leg slightly) but still provide coverage in the back. The only thing I would change about these is the rise–they come up a little lower than I would like. I would say these also run a tad big. I have them in a 26 and again, should have ordered a size down. However, they worked great to throw on over a bathing suit and more more casual outfits. You can see my post on them here. This Levi’s pair is a classic. [on the right] I liked that these were not super short of ripped up either. They have a high rise and button fly. In contrast to the other two pairs, I think these run small. [in typical Levi’s fashion] I have these in a 26 and would probably prefer a 27. The color is Havana Affair. I wore them here and here. I urge you all to do the same sort evaluation on yourself! What did you buy last year? Do you still like it or was it a waste? Take that into consideration when adding things to your cart this year.